The sign was fabricated from 1/8" aluminum, braced, and fully welded around the seams. Tabs were welded to the back side to the sign so there would be no visible sign of mounting from the front. Templates were made and pre-drilled to hole locations prior to mounting. It was mounted 3" away from building to accomodate back lighting. 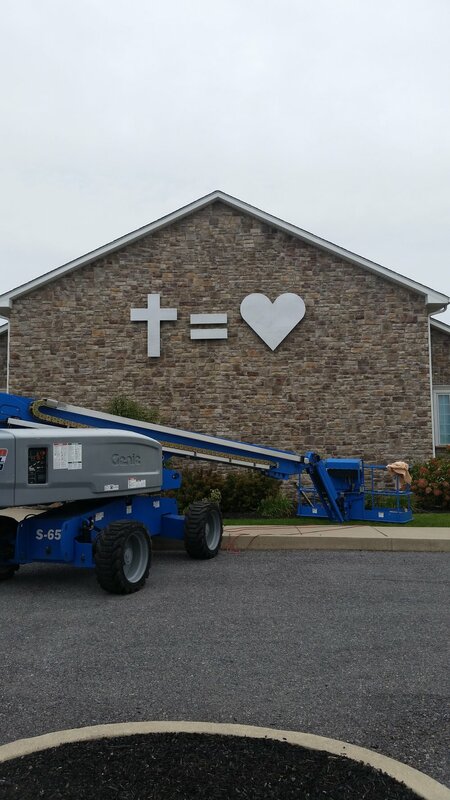 Heart and Cross are 80" high. It was finished with automotive grade metallic silver paint with clear coat for maximum durability. Back lighting provides visibility from the road at night without using spot lights. LED light strips were recessed into the back of the sign to create the floating effect shown here.